LAS VEGAS, N.V. -- The University at Buffalo women's basketball team used a quick start on Saturday evening to hold on and defeat South Dakota State, 61-55, in the final game of the South Point Shootout. The Bulls improve to 4-1 on the season with the win. "This team is just so ready to tell their story," said head coach Felisha Legette-Jack. "They fight so hard and I am just so proud of their comradery, taking care of what's in front of them. A lot of things are going on without Summer, Courtney and Finess being out as well so we were short but you know what, I told them we got to zip it down, put it in, zip it back up and play for something bigger than just yourself." UB scored 20 points in the first quarter as the Bulls shot over 50% from the field over the first 10 minutes of action. Despite leading 20-13 after the fist, the Jackrabbits came back and pulled within one at 22-21. The Bulls continued to hold on to the lead though through the remainder of the second quarter as a late jumper from Theresa Onwuka gave the Bulls the 32-29 lead into the break. Buffalo opened the second half by going on a 10-0 run over the first five minutes of action, capped off on a three-point play from Onwuka. The Jackrabbits again fought back as the Bulls held a 46-45 lead through three quarters. South Dakota State took a lead just two minutes into the fourth quarter, but sophomore Hanna Hall knocked down a big triple to give the Bulls the lead back. The two teams traded leads back and forth, but SDSU held a 55-54 advantage with 2:12 left when Cierra Dillard gave the Bulls the lead back following a layup with just under a minute left. 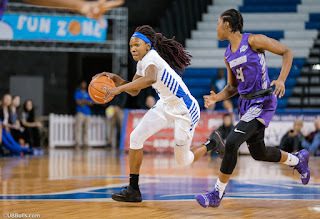 On the next possession Dillard recorded one of her six steals and converted the fast break layup, which all but clinched the win. "I told CD there's no time for you to be tired. This is your dream on the line right now," said Legette-Jack. "I'm just so grateful to have a kid like that. And I tell you Buffalo, if you don't come out and see Cierra Dillard, she doesn't happen often. This is a once in a lifetime type of kid. Not only is she a great player, but she's a wonderful person. I'm just fortunate enough to be in her midst." Dillard led the Bulls with 20 points, nine rebounds, and six steals in the contest. Onwuka added 13 points and seven rebounds on 5-of-9 shooting. Senior Brittany Morrison also scored in double figures as she had 10 points and four boards. The Bulls will return to action next Saturday when they travel to Central Connecticut State for a 1pm tipoff.